Located in Pembury, Kent and commissioned by the local Parish Council, this bespoke four bay Modular Building provides additional offices for the Parish Council. The Prefabricated Building has a total floor area of 70 sq. metres and provides an entrance lobby, office c/w kitchenette, meeting room and fully equipped DDA compliant disabled toilet. A hot/cold air conditioning system keeps the fully carpeted building at a constant temperature providing a comfortable working environment for the councillors. Cat II lighting is provided throughout along with 3 compartment dado trunking to ease the installation of IT systems. Externally, the walls are finished with easily maintainable white plastisol steel whilst the roof has a bespoke mono pitch warm deck KS 1000 Trapezoidal Roofing System with a modern overhanging eaves detail. For additional security, all doors and windows are provided with white electrically operated shutters of a galvanised steel construction. 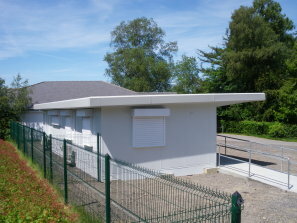 A comfortable and secure facility enabling the Parish Council to serve their community!